We have demonstrated that an 8.4 kb segment (GUS8.4) from the upstream region of the mouse α-gustducin gene acts as a fully functional promoter to targetlacZ transgene expression to the gustducin-positive subset of taste receptor cells (TRCs). The GUS8.4 promoter drove TRC expression of the β-galactosidase marker at high levels and in a developmentally appropriate pattern. The gustducin minimal 1.4 kb promoter (GUS1.4) by itself was insufficient to specify TRC expression. We also identified an upstream enhancer from the distal portion of the murine gustducin gene that, in combination with the minimal promoter, specified TRC expression of transgenes. Expression of the lacZ transgene from the GUS8.4 promoter and of endogenous gustducin was coordinately lost after nerve section and simultaneously recovered after reinnervation, confirming the functionality of this promoter. Transgenic expression of rat α-gustducin restored responsiveness of gustducin null mice to both bitter and sweet compounds, demonstrating the utility of the gustducin promoter. Current models of taste perception in humans suggest four or five primary taste submodalities: sweet, bitter, salty, sour, and umami (glutamate). Transduction of responses to sapid molecules (“tastants”) occurs in specialized neuroepithelial taste receptor cells (TRCs) organized within taste buds (for review, see Kinnamon and Margolskee, 1996; Lindemann, 1996). Na+ and H+ ions (salty and sour tastants, respectively) are thought to interact with ion channels located at the apical surface of TRC membranes (Heck et al., 1984;Gilbertson et al., 1992; Gilbertson, 1993; Lindemann, 1996; Ugawa et al., 1998). On the other hand, several lines of evidence suggest that TRC responses to both sweet and bitter compounds are transduced via seven transmembrane–helix receptors coupled to guanine nucleotide-binding regulatory proteins (G-proteins) (for review, seeKinnamon and Margolskee, 1996; Lindemann, 1996). Biochemical and molecular biological studies have identified specific components of the transduction pathways mediating responses to bitter and sweet compounds (McLaughlin et al., 1992; Ruiz-Avila et al., 1995). Gustducin is a transducin-like G-protein expressed in ∼30–40% of mammalian TRCs, all papillae of the lingual epithelium (McLaughlin et al., 1992; Takami et al., 1994; Boughter and Smith, 1998), and in TRC-like apparent chemosensory cells of the stomach, duodenum, and pancreas (Höfer et al., 1996; Höfer and Drenckhahn, 1998). Thus, α-gustducin may mark chemoresponsive cells regardless of their anatomical location. The α-subunit of rod transducin is also expressed in TRCs, although at much lower levels than is α-gustducin (Ruiz-Avila et al., 1995). The expression of gustducin and transducin in TRCs suggests that these two G-proteins may function in taste transduction as transducin does in phototransduction, i.e., to couple seven transmembrane–helix taste receptors to TRC-specific phosphodiesterases to regulate intracellular cyclic nucleotide levels (Hargrave and McDowell, 1992; Khorana, 1992;McLaughlin et al., 1994; Kolesnikov and Margolskee, 1995;Stryer, 1996). We tested the role of gustducin in taste transduction in vivo by generating α-gustducin null mice and analyzing their taste responses (Wong et al., 1996). The null mice were indistinguishable from wild type (WT) in their behavioral and chorda tympani nerve responses to NaCl and HCl. However, in contrast to WT, the null mice showed greatly reduced aversion to denatonium benzoate and quinine hydrochloride (compounds that are bitter to humans) and reduced preference for sucrose and SC-45647 (compounds that are sweet to humans). Furthermore, the null mice had diminished chorda tympani nerve responses to these same compounds. 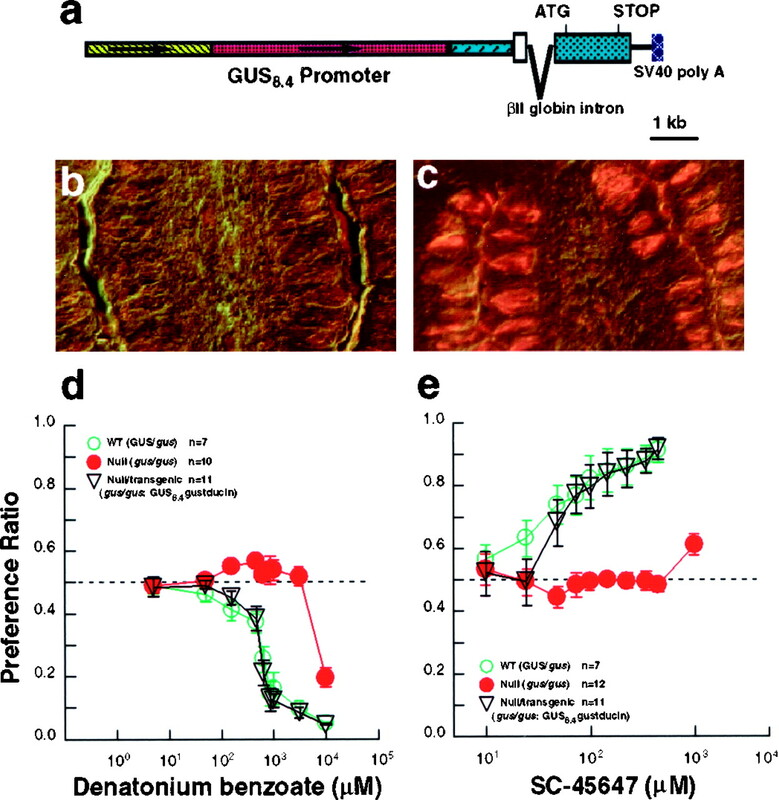 These data indicate that gustducin is a principal mediator of both bitter and sweet signal transduction. Identifying the cis-acting elements within the α-gustducin gene that target expression to TRCs would provide useful information pertinent to the control of TRC expression of gustducin and other TRC-specific factors. These elements could also be used as probes to identify and characterize taste-specific transcriptional factors and to selectively target expression to TRCs of cDNA-encoded markers and signal transduction components. To identify such elements and test their functionality, we fused portions of the upstream region of the mouse α-gustducin gene to a β-galactosidase reporter and assayed expression of the chimeras in transgenic mice. Cloning and mapping the murine α-gustducin gene and construction of transgenes. Genomic fragments from the α-gustducin locus were obtained from a 129/Sv mouse genomic library (Lambda FIX II; Stratagene, La Jolla, CA) by screening with the rat α-gustducin cDNA (pSPORTgus) [see Results and as described previously (Wong et al., 1996)]. Two of 29 independent clones isolated (l4 and l27) contained sequences that hybridized with the 5′ probe [containing the first 485 nucleotides (nt) of rat gustducin cDNA]. The genomic fragments of α-gustducin clone l4 were subcloned into pBluescript II (Stratagene, La Jolla, CA). The other genomic clones were only partially characterized but indicate that the murine gustducin gene spans at least 60 kb. The lacZ expression vectors used in this study were pPSDKlacZpA1 (Echelard et al., 1994) and phspPTlacZpA (Kothary et al., 1989). GUS1.4-lacZ was generated by subcloning into pBluescript a 1.4 kb NdeI restriction endonuclease fragment containing sequences homologous to the 5′-most portion of the rat α-gustducin cDNA and is presumed to contain the transcription initiation site. The 1.4 kb segment was excised as a BamHI fragment and then ligated into the BglII site of pPSDKlacZpA1. GUS8.4-lacZ was generated by inserting a 7 kb HindIII fragment (pH7) into the HindIII site of GUS1.4-lacZ. GUS(1.4+2.5)-lacZ and GUS(1.4+2.5rev)-lacZ were generated by isolating a 2.5 kb HindIII-EcoRV cleaved fragment from pH7, filling in the HindIII end using the Klenow fragment, and ligating the blunt ends into the SnaBI site of GUS1.4-lacZ. GUS5.9-lacZwas generated by isolating a 4.5 kb EcoRV-HindIII fragment from pH7, filling in the HindIII end, and ligating as above into the SnaBI site of GUS1.4-lacZ. GUS2.5-hsp68-lacZ was generated by cloning a blunt-ended 2.5 kb HindIII-EcoRV fragment isolated from pH7 directly upstream of the 600 bphsp68 promoter in phspPTlacZpA. GUS8.4-gustducin was generated by isolating the GUS8.4 promoter from GUS8.4-lacZ as a SnaBI-PstI fragment and inserting it into a vector containing a rabbit β-globin intron cloned upstream of the WT rat α-gustducin cDNA. Production and genotyping of transgenic mice. Before microinjection, all transgene inserts were digested withSalI and BamHI endonucleases, separated by electrophoresis in low-temperature melting agarose, and purified using Gelase (Epicentre Technologies, Madison, WI). Transgenic mice were generated by pronuclear microinjection of the purified DNA fragments into the male pronucleus of B6CBAF2/J zygotes (α-gustducin wild type: GUS/GUS) as described (Hogan et al., 1994). CD-1 female mice were used as recipients for injected embryos. B6CBAF1/J mice were used for most lacZbreeding studies. Homozygous α-gustducin null male mice (Wong et al., 1996) were mated with superovulated B6CBAF1/J females to generate zygotes for production of the GUS8.4-gustducin transgenic mice. To generate GUS8.4-lacZ or GUS8.4-gustducin transgenic mice null for α-gustducin, GUS8.4-lacZ or GUS8.4-gustducin transgenic mice were intercrossed with α-gustducin null mice (gus/gus). The second generation of intercrossed animals were genotyped by PCR to identify α-gustducin WT-lacZ or gustducintransgenic mice (GUS/GUS: GUS8.4-lacZ/gustducin) and α-gustducin null-lacZ or gustducintransgenic (gus/gus: GUS8.4-lacZ/gustducin) siblings. Founder animals were screened by genomic Southern analysis using a32P-radiolabeled lacZ-specific probe to determine the integrity of the transgene array. Screening of animals from established transgenic lines was performed as described previously (Laird et al., 1991), using the same lacZ-specific oligonucleotide primers for PCR analysis. Histochemistry and immunofluorescence. Mice were killed by CO2 asphyxiation, and the tongues were excised, fixed in 2% paraformaldehyde in 0.1 m PIPES buffer, pH 6.9, for 2 hr at room temperature, and then transferred into 20% sucrose in PBS, pH 7.4. The fixed tongues were then embedded in OCT (Tissue-Tek; Sakura Finetek USA, Torrance, CA), and 10 μm cryostat sections were collected. For the developmental series, litters of mice were killed, and tongues and tails were collected for fixation and DNA preparation, respectively. Those mice that were determined by their genotype to be transgenic were used for the present study. For 5-Bromo-4-chloro-3-indolyl-β-d-galactopyranoside immunohistochemistry, tongue tissue sections containing taste buds were processed as described previously (Echelard et al., 1994; Wong et al., 1996). Slides were stained for periods ranging from 20 min to 12 hr according to the strength of GUS-lacZ transgene expression. Sections were then counterstained in 1% neutral red, dehydrated, and mounted in Permount. Photomicrographs were obtained on a Zeiss(Oberkochen, Germany) Axiomat microscope using Kodak Ektachrome 160T film (Eastman Kodak, Rochester, NY). For immunofluorescence, sectioned tissues were blocked in PBS containing 2% BSA, 1% horse serum, and 0.3% Triton X-100 for 30 min at room temperature. The primary antibodies used were goat anti-β-galactosidase (Arnel Laboratories, New York, NY) diluted 1:500 and rabbit anti-α-gustducin (Takami et al., 1994) diluted 1:500. Primary antibodies were added to sections, which were incubated in a humidified atmosphere for 1 hr at room temperature. Sections were then washed, secondary antibodies were applied, and incubation continued for 30 min at room temperature. Secondary antibodies used were mouse anti-goat immunoglobulin conjugated with lissamine rhodamine and mouse anti-rabbit immunoglobulin conjugated with fluorescein isothiocyanate (FITC) (both from Jackson ImmunoResearch, West Grove, PA). Slides were washed and mounted in fluorescence mounting medium (Vector Laboratories, Burlingame, CA), and photomicrographs were obtained on aZeiss Axiomat microscope using Kodak Ektachrome P1600 film, with either FITC or rhodamine wavelength filters placed in the light path. Denervation. Animals were anesthetized via intraperitoneal injection of sodium pentobarbital (60 mg/kg), secured in a nontraumatic head holder and placed in a supine position. After shaving and sterilization of the throat area, a 1 cm ventral midline incision was made caudal to the lower lip and extending over the hyoid bone. Bilaterally, a small section of each glossopharyngeal nerve was surgically exposed as described previously (Oakley, 1995) and pinched approximately five to seven times with fine forceps to disrupt neural transmission. After completion of the surgery, the incisions were sutured and sterilized. Water and liquefied sterilized mouse chow were provided for 48 hr after surgery. Thereafter, mouse chow and water were available ad libitum. Behavioral analysis. Mice were genotyped by PCR for endogenous α-gustducin and neo (to determine whether they were GUS/gus or gus/gus) and for the rat α-gustducin cDNA transgene. Tested mice ranged in age from 6 to 14 weeks. Mice were individually housed, provided with food ad libitum, and presented with distilled water in two sipper bottles for 48 hr before testing. Two-bottle testing was as described previously (Wong et al., 1996). Gustducin clone l4, encompassing the 5′-end of the murine α-gustducin gene, was mapped and partially sequenced (see Materials and Methods). To identify TRC transcriptional elements, portions of clone l4 were cloned upstream of the lacZ reporter gene (Fig. 1). β-galactosidase expression in TRCs from transgenic offspring was determined by histochemistry and/or immunofluorescence (results are summarized in Table1). A candidate minimal promoter (GUS1.4) contained within the proximal 1.4 kb fragment did not drive expression of β-galactosidase to TRCs or other tissues unless it was coupled to a gustducin enhancer (Table 1; see below). In contrast, the entire 8.4 kb fragment (GUS8.4) from the gustducin upstream region directed consistently high levels of β-galactosidase expression to TRCs in all transgenic lines and G0 founder mice tested; β-galactosidase was also detected in a limited subset of retinal interneurons (Table 1). GUS8.4-lacZ transgenic lines and G0 mice expressed β-galactosidase in ∼30–40% of TRCs from fungiform, foliate, or circumvallate papillae (Table 1, Fig. 2), comparable with the level of expression of endogenous gustducin. Based on the immunofluorescence analysis, at least 80% of the gustducin-positive TRCs from GUS8.4-lacZ transgenic mice were also positive for β-galactosidase expression, and no β-galactosidase positive/α-gustducin negative TRCs were observed, suggesting that the GUS8.4 promoter drives β-galactosidase to the appropriate TRCs. Using a more sensitive means of detection, single-cell PCR analysis of a GUS8.4GFP (green fluorescent protein) reporter line showed coexpression of endogenous gustducin in >90% of the transgenically marked cells (L. Huang, Z. Zheng, L. Ruiz-Avila, and R. F. Margolskee, unpublished observations). Schematic diagram of the murine gustducin promoter and reporter constructs used to map promoter elements.a, Diagram of the 5′ end of the murine α-gustducin locus, including its promoter region (yellow,red, and blue boxes): first exon, including the 5′ untranslated region (open box), the protein-coding region (filled box), and the translation initiation codon (ATGmet ). Restriction endonuclease sites used to generate promoter mapping constructs are indicated. b, Map of the GUS-lacZ reporter constructs. Various segments from the gustducin locus (a) were cloned upstream of thelacZ expression cassette (purple box). The lacZ gene was modified to include a consensus ribosome initiation site, an in-frame ATGmet initiation codon, and an SV40 poly adenylation sequence (cross-hatched box).Arrows indicate transcriptional orientation. The 2.5 kb fragment (a) was cloned upstream of thehsp68 minimal promoter to generate the GUS2.5+hsp68-lacZ reporter construct. Expression of β-galactosidase in mice carrying gustducin promoter-lacZ transgenes. GUS8.4-lacZ transgenic mice (a–f) expressed β-galactosidase, assayed histochemically, in all lingual taste papillae, including circumvallate (a), foliate (b), and fungiform (c). β-galactosidase expression, assayed immunofluorescently, in foliate taste buds (d), colocalized to the same taste cells that expressed endogenous α-gustducin (e), further demonstrated by coincident double-staining immunofluorescence (f). β-Galactosidase, assayed histochemically, was expressed in the circumvallate papillae from mice carrying the GUS(1.4+2.5)-lacZ(g) and GUS(1.4+2.5rev)-lacZ(h) transgenes. Transgenic mice carrying the GUS2.5+hsp68-lacZ construct (i) showed expression in tongue muscle but not in taste buds. To identify specific cis elements and transcriptional enhancers within the GUS8.4 promoter, several constructs were made and used to generate transgenic mice (Fig. 1). Transgenes containing the 2.5 kb distal portion of GUS8.4 in either transcriptional orientation linked to the minimal GUS1.4promoter reliably led to expression of LacZ in TRCs and a limited subset of retinal interneurons (which also expressed endogenous gustducin) (Table 1, Fig. 2g,h). These results indicate that the distal 2.5 kb region contains a taste-specific enhancer. Transgenic mice carrying the minimal GUS1.4promoter coupled to the distal 2.5 kb element, but lacking the central 5.9 kb portion of GUS8.4 (Figs. 1,2g,h), showed variability in the level and number of TRCs expressing β-galactosidase (Table 1). This variability was independent of copy number (data not shown), suggesting that the expression of these transgenes may be affected by the site of integration. This was in distinct contrast to transgenic mice carrying GUS8.4 promoter constructs in which many TRCs were β-galactosidase-positive and displayed uniformly high levels of expression (Fig. 2a–f), implying that there are alsocis elements in the 5.9 kb fragment. To determine whether the 2.5 kb taste enhancer is promoter-independent, it was coupled to the hsp68 minimal promoter (Fig. 1); this construct was not expressed in TRCs but was highly expressed in tongue muscle (Table 1, Fig. 2i). Apparently, the 2.5 kb element functions as a taste-specific enhancer that interacts with additional elements within the GUS1.4 minimal promoter. Transgenes containing the 5.9 kb fragment linked to the GUS1.4promoter gave no expression in TRCs but led to ectopic expression in cells associated with the base of taste buds (Table 1, Fig.2i). We conclude that there are cis elements present in the 2.5 and 5.9 kb fragments that interact with each other and with the 1.4 kb minimal promoter to specify TRC-appropriate expression. We compared the developmental pattern of expression of β-galactosidase driven by the GUS8.4 promoter with that of endogenous gustducin. Taste bud and taste receptor cell development in mice occurs postnatally, whereas the taste papillae arise during late fetal development (Mistretta, 1991; Fritzsch et al., 1997). In the C57BL/6 × CBA genetic background, gustducin-expressing TRCs are absent at birth but begin to appear within taste papillae at postnatal day 4 (P4) (Fig. 3a) and increase in number and density within distinct bud structures over the next 7–10 d (Fig. 3d,g,j). By P14, the taste buds and papillae display the adult pattern (Fig.3j–l). During each stage of postnatal TRC maturation, most of the cells that expressed α-gustducin also expressed β-galactosidase, typically 80–90% as determined by double staining (Fig.3c,f,i,l). We conclude that expression of transgenes driven by the GUS8.4operates according to the same developmental program that regulates expression of endogenous gustducin. Coincident expression of endogenous α-gustducin and GUS8.4-lacZ-encoded β-galactosidase during postnatal development. Indirect immunofluorescent staining of circumvallate (a–i) and foliate (j–l) papillae from GUS8.4-lacZ mice at 4 (a–c), 7 (d–f), 11 (g–i), and 14 (j–l) d after birth. The double-staining and photography were as for Figure 2d–f.a, d, g, andj were imaged for α-gustducin immunoreactivity;b, e, h, andk (corresponding to a, d,g, and j, respectively) were imaged for β-galactosidase immunoreactivity; c,f, i, and l are double exposures to demonstrate coincident expression of αgustducin and β-galactosidase. Murine taste buds within the circumvallate and foliate papillae apparently require trophic factors derived from fibers of the facial or glossopharyngeal nerves (Zhang et al., 1997). Denervation of the circumvallate or foliate papillae leads to degeneration of TRCs and taste buds within 10 d to 2 weeks, depending on the particular species (Oakley, 1970; Oakley et al., 1998), along with concomitant loss of gustducin (demonstrated in rat; McLaughlin et al., 1992). Regeneration of the nerve restores the TRCs and taste buds and their expression of gustducin (McLaughlin et al., 1992). To determine whether the pattern of expression of the β-galactosidase transgene and endogenous gustducin was coordinately regulated after nerve degeneration and regeneration, the two glossopharyngeal nerves were crushed, and then the lingual epithelium was examined for TRC appearance and expression of β-galactosidase and gustducin. At 10 d after denervation, the majority of taste buds and TRCs of the circumvallate papilla had disappeared, leaving only a few gustducin-positive cells that also expressed β-galactosidase (Fig.4a–c). At 12 d after denervation, the epithelium of the circumvallate trench had receded to take on the appearance of nongustatory lingual epithelium; at this stage, there was no expression of either gustducin or β-galactosidase (Fig. 4d–f). At 14 d after denervation, both taste buds and TRCs started to regenerate, as evidenced by the appearance of gustducin-positive, elongated bipolar cells (Fig.4g). Most of these cells also expressed β-galactosidase (Fig. 4h,i), demonstrating similar regulation of gene expression from the transgenic GUS8.4 promoter and the endogenous gustducin promoter. Coincident expression of endogenous α-gustducin and GUS8.4-lacZ-encoded β-galactosidase in circumvallate taste buds after denervation–reinervation. 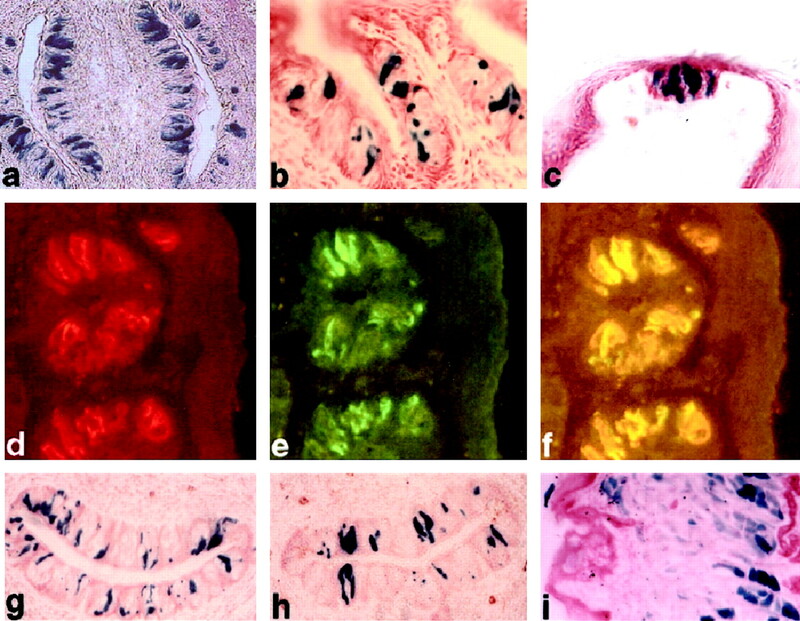 Indirect immunofluorescent staining of circumvallate papillae at 10 (a–c), 12 (d–f), and 14 (g–i) d after bilateral glossopharyngeal nerve section. The double-staining and photography were as for Figure 2.a, d, and g show α-gustducin immunoreactivity; b, e, andh show β-galactosidase immunoreactivity;c, f, and i are double exposures to demonstrate overlap of α-gustducin and β-galactosidase expression. Note complete loss of both α-gustducin and β-galactosidase at 12 d after section and their coincident reappearance 14 d after section. We generated previously α-gustducin null mice by targeted gene replacement (Wong et al., 1996). These mice are deficient in their taste responses to several bitter and sweet compounds but are normally responsive to NaCl and HCl (i.e., salty and sour stimuli). Light microscopy of the taste buds of homozygous α-gustducin null mice indicated that the morphology and number of taste buds and TRCs appeared normal (Wong et al., 1996). Electron microscopy of TRCs corroborated this observation and suggests that the number of dark and light TRCs appears normal in taste buds of gustducin null versus WT mice (T. Crosby and J. C. Kinnamon, personal communication). To demonstrate directly that the absence of gustducin does not lead to loss of a lineage or developmental stage of TRCs that normally express gustducin, we generated GUS8.4-lacZ transgenic mice that were null for α-gustducin. 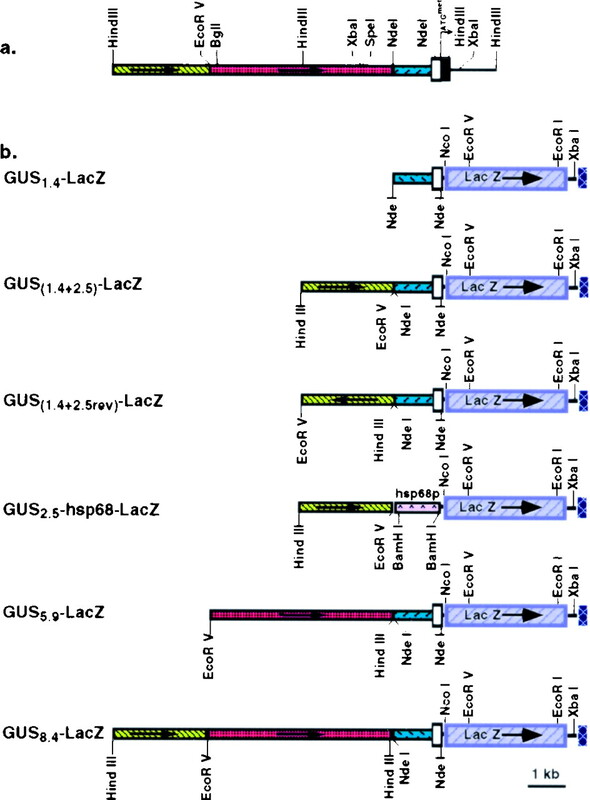 The number and distribution of β-galactosidase-positive TRCs in GUS8.4-lacZtransgenic animals did not differ between gustducin-positive and gustducin null mice (Fig. 5). We conclude that there are TRCs in the gustducin null mice capable of transcribing genes driven by the GUS8.4 promoter, demonstrating that the lack of α-gustducin did not delete a cell lineage or developmental stage of TRCs. Expression of β-galactosidase in wild-type and α-gustducin null mice carrying the GUS8.4-lacZ transgene. 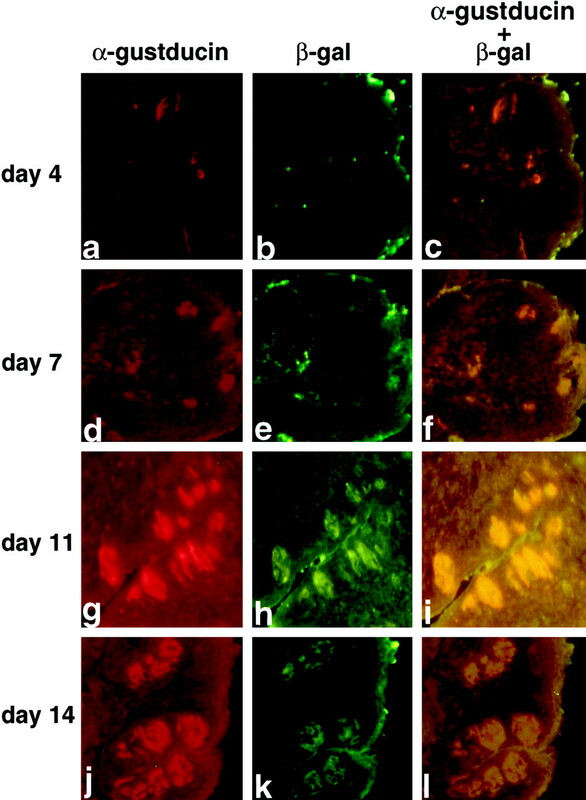 Histochemical staining of taste bud-containing sections from GUS8.4-lacZ transgenic mice that are α-gustducin WT (GUS/GUS) (a, c) or α-gustducin null (gus/gus) (b,d). Foliate (a, b) and circumvallate (c, d) papillae are shown. Similar numbers of TRCs and taste buds were seen in sections from WT and α-gustducin null mice. The pattern of expression of the β-galactosidase transgene (Figs. 2-4) demonstrates that GUS8.4-lacZ is efficiently expressed in the same subpopulation of TRCs that normally express α-gustducin. The GUS8.4 promoter should be generally useful to target cDNA-encoded proteins to TRCs that normally express α-gustducin. We used the GUS8.4 promoter to express a WT rat gustducin cDNA in gustducin null mice. This tests the ability of the GUS8.4 promoter to target expression of cDNAs to mature functional TRCs. The GUS8.4-gustducin transgene used to rescue the taste defects of the α-gustducin null mice is diagrammed in Figure6a. The GUS8.4-gustducin transgene was specifically expressed in ∼30–40% of the TRCs of the null mice (Fig.6c), comparable with the expression pattern of endogenous gustducin in WT mice (compare with Fig. 2d). Transgenic complementation of α-gustducin null mice by the wild-type rat α-gustducin cDNA driven by the GUS8.4 promoter. a, Map of the GUS8.4-gustducin transgene. The GUS8.4 promoter is as in Figure 1, and the rat gustducin cDNA is as described previously (McLaughlin et al., 1992). 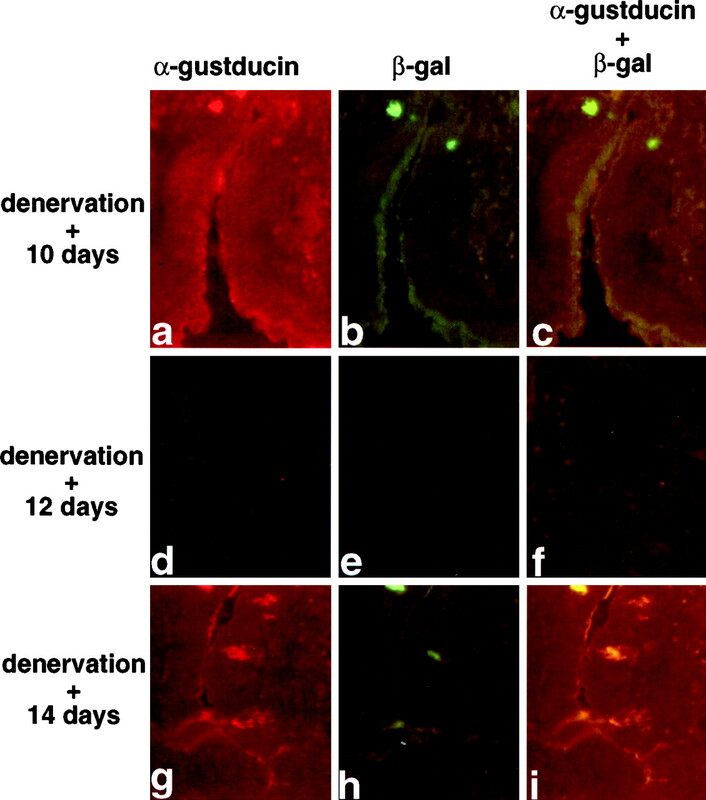 Indirect immunofluorescent staining of α-gustducin expression in a nontransgenic homozygous null (gus/gus) mouse (b) and a GUS8.4-gustducin transgenic α-gustducin null (gus/gus:GUS8.4-gustducin) sibling (c). Sections were photographed with both fluorescent light, as well as differential interference contrast optics. d, e, Mean preference ratios from 48 hr two-bottle preference tests of male nontransgenic heterozygotes (WT; green open circles), null (gus/gus; red filled circles), and null/transgenic (gus/gus:GUS8.4-gustducin;black open triangles) mice. Behavioral responses to denatonium benzoate of WT (n = 7), null (n = 10), and null/transgenic (n = 11) mice (d). Behavioral responses to SC-45647 of WT (n = 7), null (n = 12), and null/transgenic (n = 11) mice (e). ANOVA andt tests showed no difference between WT and null/transgenic mice, although both of these populations differed from null/nontransgenic mice. To determine whether transgenic expression of the rat α-gustducin cDNA in the null background restored normal function, populations of heterozygous WT (GUS/gus), null (gus/gus), and transgenic/null (gus/gus: GUS8.4-gustducin) mice were tested for their behavioral responses to bitter and sweet compounds. Null mice were profoundly deficient in their responses to the bitter compound denatonium benzoate and the sweet compound SC-45647 (Fig.6d,e), as was shown previously (Wong et al., 1996). Expression of the GUS8.4-gustducintransgene in the null background functionally restored behavioral responses to both the bitter and sweet compounds (Fig.6d,e). ANOVA indicated no statistically significant differences between GUS/gus andgus/gus:GUS8.4-gustducin mice, although both populations differed from gus/gus(null/nontransgenic) mice (p < 0.0001 for all concentrations of denatonium; p < 0.01 at 50 μm SC-45647; p < 0.0001 for SC-45647 concentrations ≥75 μm). Individual t tests showed no difference between GUS/gus andgus/gus:GUS8.4-gustducin mice, although both groups of animals differed from the gus/gusmice (p < 0.001 for denatonium concentrations ≥150 μm; p < 0.01 at 50 μm SC-45647; p < 0.0001 for SC-45647 concentrations ≥75 μm). This experiment provides formal proof that the taste defects observed in the gustducin knock-out mice are specifically attributable to the lack of gustducin expression rather than adventitious changes of neighboring gene expression caused by the homologous recombination event. These results also demonstrate the feasibility of targeting cDNA-encoded proteins to TRCs in which they can be functionally analyzed in vivo. We have recently used this same approach to target expression to the gustducin lineage of TRCs of mutated forms of α-gustducin to study the protein–protein interactions involved in sweet and bitter taste transduction (our unpublished observations). In the present study, we have identified a fully functional taste cell promoter (GUS8.4) within the upstream region of the mouse α-gustducin gene. The GUS8.4 promoter drove expression of β-galactosidase at high levels selectively in the gustducin-positive subset of TRCs. We identified within the proximal 1.4 kb of the upstream region a minimal promoter that specified TRC expression and within the distal 2.5 kb of the upstream region, a TRC enhancer. Within the middle 5.9 kb region, another ciselement was identified that, on its own, drove expression to cells at the base of the taste bud but not in TRCs or the taste buds themselves. In multiple independent lines of mice, the GUS8.4 and GUS(1.4+2.5) promoters drove β-galactosidase expression to a population of retinal interneurons that also expressed endogenous gustducin. In future studies, we will analyze the function of these cells in WT and α-gustducin null mice. The differentiation of TRCs and TRC stem cells from epithelial precursors is a complex process dependent on innervation and trophic factors. The commitment to become a stem cell precursor to a TRC and the developmental program that gives rise to the mature TRC must involve regulated expression of stem cell- and TRC-selective genes. In certain lines, the complete GUS8.4 promoter drove expression of reporters and cDNAs in a manner indistinguishable from that of the endogenous α-gustducin promoter. GUS8.4-driven transgenes showed the same pattern of loss after denervation and recovery after reinnervation as did the endogenously expressed α-gustducin, suggesting that the trophic factors that regulate expression of α-gustducin act at sites within the GUS8.4 region. The morphological–structural distinction among TRC subtypes (light vs dark cells) must also depend on transcriptional control and differential gene expression; that GUS8.4 drove β-galactosidase expression to the gustducin-positive subset of light TRCs suggests that thecis elements that specify expression in light-type TRCs are present within the 8.4 kb upstream region. Future studies focusing on the TRC-expressed transcription factors, which bind to DNA sequences within the GUS8.4 region, may yield information about the early steps of TRC commitment. Other genes that are thought to be selectively expressed in TRCs (e.g., G-protein βγ subunits, regulator of G-protein signalling proteins, taste receptors, ion channels, etc.) may have similar cis elements in their promoter regions, and this may be used to attempt their identification and cloning. Conversely, the upstream regulatory regions of TRC transduction components may be compared with that of α-gustducin to search for common cis elements. The GUS8.4-lacZ transgene provides a useful histological marker for gustducin-expressing TRCs, allowing the ability to specifically identify and isolate the gustducin-positive subset of TRCs for single-cell electrophysiological recording and/or single-cell PCR. 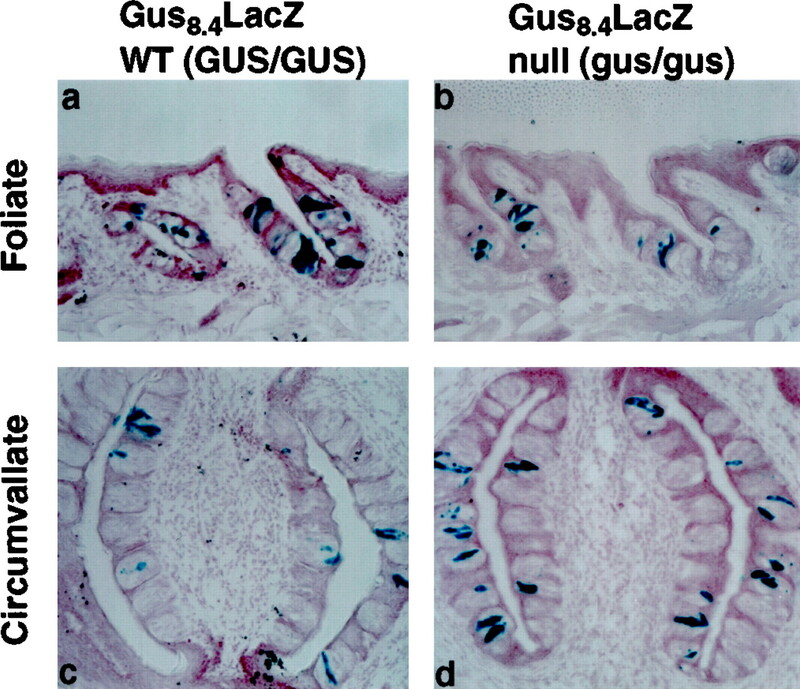 The GUS8.4-lacZ reporter was used to identify the gustducin lineage of TRCs, even in α-gustducin null mice, demonstrating that gustducin need not be expressed for the GUS8.4 promoter to function or for TRCs to develop. This suggests that the α-gustducin deficiency does not result in the deletion of a specific TRC lineage or otherwise compromise the generation of cells competent to express gustducin and other TRC-expressed factors. Rather, these TRCs are present in the taste papillae in appropriate numbers and have maintained the expression of genes required for mature TRC function. When the GUS8.4promoter was used to express a WT rat α-gustducin cDNA in TRCs of gustducin null mice, behavioral responses to bitter and sweet compounds were fully restored. However, when a dominant negative form of α-gustducin was expressed from the GUS8.4 promoter, behavioral responses to sweet and bitter compounds were dramatically diminished, indicating that the mutated gustducin protein competitively inhibited sweet and bitter transduction pathways (our unpublished observation). The GUS8.4 promoter will be extremely useful for its ability to drive expression of histological markers, mutated forms of gustducin, and WT or altered signal transduction elements to study critical domains and specific functions of gustducin and other elements of taste transduction. The GUS8.4 promoter could be used to conditionally express factors that would be toxic or lethal to TRCs (e.g., diphtheria toxin for conditional TRC ablation and GTPase deficient G-proteins for conditional expression of constitutive active G-proteins). This research was supported by National Institutes of Health Grants RO1DC03055 and R01DC03155 (R.F.M.) and F32DC00142 (G.T.W. ), and Comissió Interdepartamental de Recerca i InnovacióTecnológica Grant BEAI-300089 (L.R.-A.). R.F.M. is an Associate Investigator of the Howard Hughes Medical Institute. Dr. K. S. Gannon performed the glossopharyngeal nerve sectioning. We thank Dr. C. Mistretta for helpful discussions. Correspondence should be addressed to Robert F. Margolskee, Howard Hughes Medical Institute, Department of Physiology and Biophysics, The Mount Sinai School of Medicine, Box 1677, One Gustave L. Levy Place, New York, NY 10029. Dr. Wong’s present address: Department of Central Nervous System/Cardiovascular Discovery Research, Schering-Plough Research Institute, 2015 Galloping Hill Road, Kenilworth, NJ 07033. Dr. Ruiz-Avila’s present address: Almirall Prodesfarma, Cardener 64, 08022 Barcelona, Spain. (1998) Amiloride blocks acid responses in NaCl-best gustatory neurons of the hamster solitary nucleus. J Neurophysiol 80:1362–1372. (1994) Cis-acting regulatory sequences governing Wnt-1 expression in the developing mouse CNS. Development 120:2213–2224. (1997) Mice with a targeted disruption of the neurotrophin receptor trkB lose their gustatory ganglion cells early but do develop taste buds. Int J Dev Neurosci 15:563–576. (1993) The physiology of vertebrate taste reception. Curr Opin Neurobiol 3:532–539. (1992) Proton currents through amiloride-sensitive Na channels in hamster taste cells. Role in acid transduction. J Gen Physiol 100:803–824. (1992) Rhodopsin and phototransduction: a model system for G protein-linked receptors. FASEB J 6:2323–2331. (1984) Salt taste transduction occurs through an amiloride-sensitive sodium transport pathway. Science 223:403–405. (1998) Identification of the taste cell G-protein, α-gustducin, in brush cells of the rat pancreatic duct system. Histochem Cell Biol 110:303–309. (1996) Taste receptor-like cells in the rat gut identified by expression of α-gustducin. Proc Natl Acad Sci USA 93:6631–6634. (1994) Manipulating the mouse embryo: a laboratory manual, Ed 2. (Cold Spring Harbor Laboratory, Cold Spring Harbor, NY). (1992) Rhodopsin, photoreceptor of the rod cell. An emerging pattern for structure and function. J Biol Chem 267:1–4. (1996) Mechanisms of taste transduction. Curr Opin Neurobiol 6:506–513. (1995) A cyclic-nucleotide-suppressible conductance activated by transducin in taste cells. Nature 376:85–88. (1989) Inducible expression of an hsp68-lacZ hybrid gene in transgenic mice. Development 105:707–714. (1991) Simplified mammalian DNA isolation procedure. Nucleic Acids Res 19:4293. (1996) Taste reception. Physiol Rev 76:719–766. (1992) Gustducin is a taste-cell specific G-protein closely related to the transducins. Nature 357:563–569. (1994) Molecular cloning of G proteins and phosphodiesterases from rat taste cells. Physiol Behav 56:1157–1164. (1991) Developmental neurobiology of the taste system. in Smell and taste in health and disease, eds Getchell TV, Doty RL, Bartoshuk LM, Snow JB (Raven, New York), pp 35–64. (1970) Reformation of taste buds by crossed sensory nerves in the rat’s tongue. Acta Physiol Scand 79:88–94. (1995) Denervation and reinervation of the tongue. in Experimental cell biology of taste and olfaction, eds Spielman AI, Brand JG (CRC, Boca Raton, FL), pp 59–63. (1998) The morphogenesis of mouse vallate gustatory epithelium and taste buds requires BDNF-dependent taste neurons. Brain Res Dev Brain Res 105:85–96. (1995) Coupling of bitter receptor to phosphodiesterase through transducin in taste receptor cells. Nature 376:80–85. (1996) Vision: from photon to perception. Proc Natl Acad Sci USA 93:557–559. (1994) Human taste cells express the G protein α-gustducin and neuron-specific enolase. Mol Brain Res 22:193–203. (1998) Receptor that leaves a sour taste in the mouth. Nature 395:555–556. (1996) Transduction of bitter and sweet taste by gustducin. Nature 381:796–800. (1997) BDNF is required for the normal development of taste neurons in vivo. NeuroReport 8:1013–1017.